The stretch of subfreezing weather has started to slow up the water works not just in homeowners pipes, but in mother natures plumbing as well. Area water ways big and small have been grinding to an icy halt. 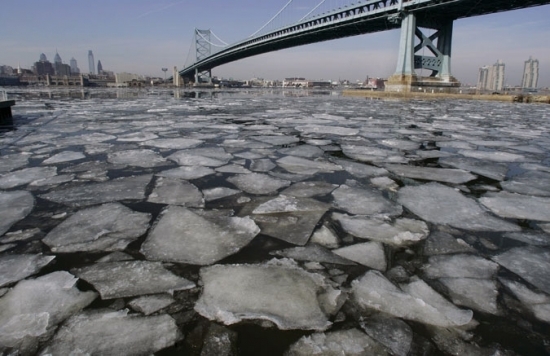 It may not matter to the creek in the back yard, but the Delaware River is a major shipping route and can't just close because it wants to freeze. The Coast Guard has been busy with it's two ice-breaking tug boats freeing up the ice flows (sometimes 6-8 inches thick) and making the waterways passable to commercial traffic. Right now only steel-hulled ships are allowed out on the river from the Chesapeake-and-Delaware canal north to the Betsy Ross Bridge. They'll continue to be busy this week as temperatures are headed back down to 0 on Friday morning. An altercation outside of a meat-packing plant in Montgomery County this morning has left one man dead and another one injured and suspected of murder. It happened around 8:45 a.m. at the JBS-Mopac Rendering Facility on Souder Road in Franconia Township. A workplace dispute broke out between the two employees in the parking lot and became violent. The victim, 25-year-old Danny Vazquez, was taken to Abington-Lansdale Hospital were he was pronounced dead from stab wounds. A second man described as a suspect was taken to Paoli Memorial Hospital also for treatment of slash and stabs wounds. A knife was recovered at the scene. No charges have been filed. Authorities are still investigating the incident. An autopsy will be performed on Thursday. Philadelphia District Attorney Seth Williams filed a lawsuit on Wednesday challenging Governor Tom Wolf's recent moratorium on the death penalty. Last Friday, Wolf said he would not sign death warrants and continue to issue reprieves at least until he receives a report started by a legislative commission in 2011. Williams' suit says Wolf's action was illegal and unconstitutional and is appealing to the PA Supreme Court. In particular, the DA notes the case of Terrance Williams who was convicted in 1984 of robbery and murder and whose execution was supposed to be March 4th after lengthy courts battles over his sentence. "Pursuant to Article 4, Section 9 of the Pennsylvania Constitution, Governor Wolf has the power to grant reprieves," the spokesperson wrote. "The governor took the action to place a moratorium on the death penalty because Pennsylvania's capital punishment system is flawed - it's ineffective, expensive, and many times unjust. As he stated Friday, the governor will wait for the report being produced by the bi-partisan Pennsylvania Task Force and Advisory Commission on Capital Punishment, established by the state Senate, and the recommendations within the report are addressed satisfactorily."